You’ve seen them everywhere, intricate wood crafts which decorate homes, cabinets and produce the fine detail on home made furniture, shelving and moldings. Indeed, the scroll saw is the creative carpenters best friend, and no workshop which engages in creating unique pieces can be without one. 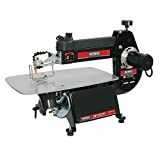 If you are interested in moving on from creating basic shelves and frames, to pumping out magnificent scroll work frames, scalloped edge work, clocks, and even purchase some fun holiday patterns in order to make enjoyable stand up decorations for your yard, then you must look into purchasing a brand name scroll saw. In years past, when you saw creatively cut wood work, it was all done by hand with hand held coping saws. Today, carpenters have it much easier with the invention of the motorized scroll saw. In fact, ‘scrollers’ are a very specific breed of wood workers. For scrollers, creating is not so much the result of a need, but one of pure creativity. This must be remembered when looking to purchase your first scroll saw. Ask a scroller what is the best scroll saw to purchase, and they’ll tell you what works for them. However, what works for them may not really work for you. Scrollers are basically hobbyists. They are more interested in creating a scalloped edge for a mirror, or weather vane, than they are of building a utilitarian cabinet. This means that it’s important to seriously consider what you plan to create, and purchase your scroll saw accordingly. Below we have created a basic review and buyers guide for the best power scroll saws. Each one is unique, and serves the purpose of those who need those features to create. 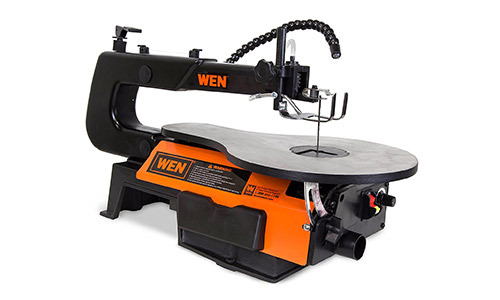 The WEN 3920 16-Inch, 1.2 Amp, Variable Speed Scroll Saw is one of the best scroll saws on the market, allowing you to slice through 2 inches of hardwood quickly and cleanly. This scroll saw with its 9/16 inch stroke comes with adjustable speeds from 400 to 1600 SPM, or strokes per minute. Scrollers are well aware that when doing intricate designs, vibration is not welcome, and can interfere greatly when making accurate cuts, thankfully the WEN’s cast iron base reduces vibration. The table measures 16 x 11 inches, bevels up to 45 degrees, and a convenient air pump blows saw dust away from your work area. This two direction saw is capable of using blades in 2 directions: Standard and 90 degrees. Features include: An easy to position LED light, foot lock clamp, onboard storage, dust port and 3 blades. Dremel is a name quite familiar with craftsmen the world over. The Dremel Moto-Saw Variable Speed Compact Scroll Saw comes with .6 Amps of power, and is designed to cut your laminates, metal, wood and plastic materials with accuracy and ease. This Moto-Saw can even be separated from the base in the event you need a coping saw for fine detail work. This model comes complete with a tough, durable storage case, 10 blades, shop vac adapter and fast clamp base. Never be concerned about tension when working the curves, as the Moto-Saw’s Auto-Tensioning feature ensures that your blade will remain taut. Features include: hold down foot release, guide rail, fence lock lever, speed dial switch, quick release button, and dust adapter. The Shop Fox 16-Inch, cast iron constructed, variable speed scroll saw, is an affordable, durable and easy to use saw for scrollers. This variable speed scrolling saw has been carefully designed to pass tough quality control tests to ensure you get the best performance available. 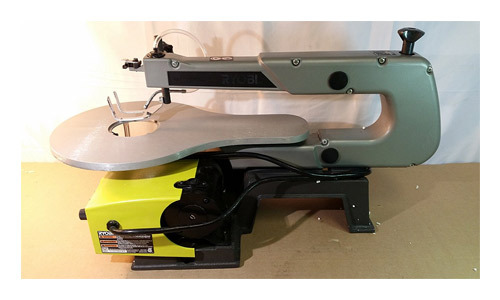 The Shop Fox W1713 can use either plain blades and pinned blades, has a variable speed control, a nice sized work table with a 45 degree tilt ability, and weights in at a light 31 pounds. As for the motor, it’s a 1/8 HP, speeds are variable, speed of 550 to 1650 STM strokes per minute, and 1.2 amps of drive. Your blade stroke is .25 inches, max cutting width is 16 inches with a minimum cutting thickness of 2 inches. Features include: Gooseneck lamp, dust port, and air nozzle. Dewalt has been manufacturing fine, high performance and high quality tools for their customers for many years. 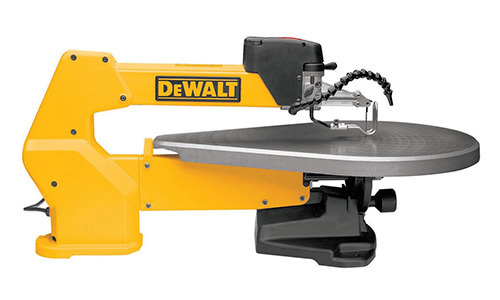 The Dewalt DW788 1.3 Amp, 20 inch, heavy duty Variable-Speed Scroll Saw is durable, and creates ultra smooth precision cuts on a variety of materials such as metal, plastic, and wood. The cast iron table gives you a stable, and nice size area to work, while its exclusive arm design ensures you’ll be able to make the intricate designs, all scrollers strive to make. 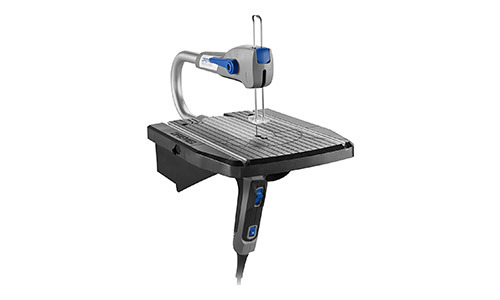 Features include a blade tension lever, speed control knob, carbon brush inspection, material hold down, bevel lock knob, and positionable air hose to keep the saw dust from your work area. As for scroll speeds, they go from 400 to 1750 SPM, strokes per minute. For added security, the Dewalt comes with 3 amp overload protection in case your saw overheats during use. The 1.3 amp Jet727200K Scroll Saw is a heavy duty, durable piece of machinery weighing 89.7 pounds, and ready to do just what you ask of it. With simple and easy blade changing system and 22 inches of throat mean that you’ll be able to tackle larger jobs with no problem. For precision custting, the spring loaded arm conveniently tilts 40 degrees to the left, and 45 degrees to the right. The cast iron table measures 12-7/8 x 23 inches and is designed to reduce vibration. Features include: Variable speeds from 400 to 1500 strokes per minute, a max cutting depth of 2 inches, material hold down, foot switch, stand and onboard dust blower to keep the sawdust off your work area. The stand is also adjustable, and can be raised or lowered to 4 different height settings. Let the Ryobi 16 in. Corded Scroll Saw, model SC165VS be the perfect addition to your home or small business workshop. 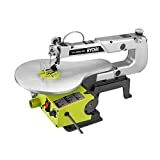 This 16 inch scroll saw by Ryobi has a 16 inch throat, 5 inch pin or plain blade, 1.2 Amps of power and a no load speed of 550 to 1650 strokes per minute. The sawdust exhaust lets to hook up any 1.25 inch vacuum hose, and the blower can keep your working area free from dust. Features for the SC165VS include a bevel scale, 0 to 45 degree tilt, blade tension knob, drop foot, drop foot lock knob, switch and switch key, bevel lock knob and variable speed knob. Skil is a top name in tools, and for good reason, they have manufacturing dependable tools for home and business for years. 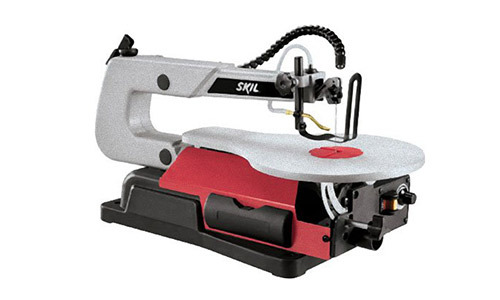 The Skil 16 inch, 1.2 Amp scroll saw is no exception with its 16 inch throat, 5 inch pin-end blade, cutting capacity of 2 inches at a 90 degree angle, and 7/8 inch blade stroke. No load speed is 500 to 1700 strokes per minute, and the LED light helps you to have a clear view of your cut line. The 3335 comes with rubber bearing covers, blade guard foot, blade tension lever, sawdust blower, table and bevel lock knobs, onboard storage, dust collection port, and easy to access speed control dial. 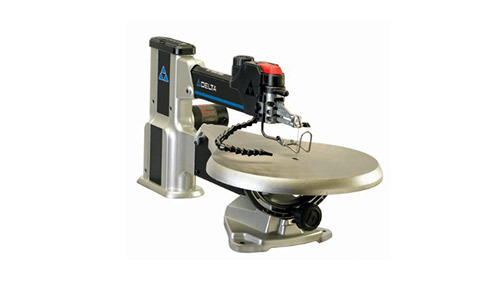 The Delta 40-694 29 inch Variable Speed Scroll Saw comes with 1.3 Amps of power, onboard blade storage, and 2 blades. Hold your project steady on its cast iron work table measuring 16 x 24 inches, which bevels 0 to 45 degrees left or right. The variable speeds range from 400 to 1750 strokes per minutes, and the dual parrallel link arm cuts down on vibration and noise, ensuring that your blade always maintains an accurate and clean cut. Blade change is easy with the lift and lock arm. Cutting capacity is 2-1/8 inches at 90 degrees and 1-5/8 inches at 45 degrees, the entire saw weighs in at 70 pounds. Features include: Air hose to keep your area free from dust, speed control knob, and a 3 Amp overload protector fuse. For woodworkers who are familiar with the popular Excalibur scroll saws, then you just might love the King Industrial 16 inch Scrolling Saw, as it’s made by the same manufacturer. The XL-16 is variable speed saw, giving you between 400 to 1400 SPM, strokes per minute, with a 5 inch blade, a 1.3 Amp motor and weighs in at 55 pounds, assembled. The XL-16’s head conveniently tilts to 30 degrees left and 45 degrees right for a smooth, precise cut. 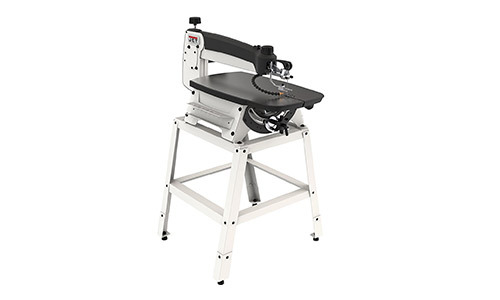 Features include upper and lower parallel arms, 12 x 18-1/2 inch stable, table cutting surface, onboard blower, controls for both speed and tension, and comes complete with 5 inch pinless blades, hex key, and blade tension lever kit. 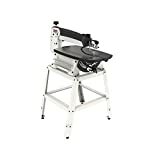 Get creative with the ShopSeries RK7315 16 inch Scroll Saw with its die cast aluminum table bevels 0 to 45 degrees, and is perfect for woodworkers looking for a lighter scroll saw. The RK7315 comes with a 1.2 Amp motor, which is more than enough to handle most projects, a no load speed of 500 to 1700 strokes per minute, a max cutting depth of 2-1/2 inches and a 16 inch throat depth. This saw comes with 2 tough tungsten carbide blades, has a 4/5 inch stroke, an integrated sawdust blower, blade guard, 2 blades and dust port. 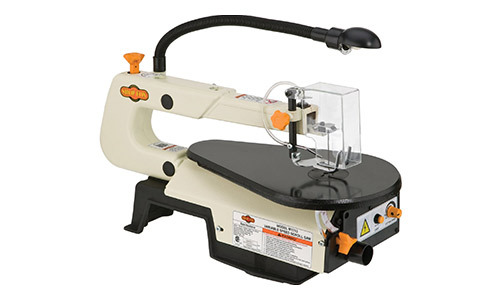 Choosing the best power scroll saw for you is not as foreboding as it seems. All you have to do is to know what you want to do with it. For instance, do you want to create yard decorations, open up a framing business, or perhaps you are a cabinet maker who simply needs it to add a bit of fancy edge work to your cabinets. Trim is expensive, so perhaps you just want it to create your own when you need it. So, to assist you on your journey, we’ve outlined a few of the basic essentials to consider when purchasing your scrolling saw below. Depending on the type of woodworking you will be doing, choosing the correct blade makes all the difference. When you get into scrolling, you’ll find an amazing assortment of blades on the market, and there are debates regarding blade use, but expert scrollers tell us that in general, if your scroll saw accepts plain-end blades, then you’ll have more of a blade selection to choose from. 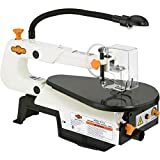 Of course, a scroll saw that accepts both plain and pin-end blades will give you more versatility, and if you want a scroll saw to grow with you, then purchasing one that can accept both blades is the best idea. People do some fabulous and intricate work with their scroll saws, and for many speed control is important. This ties into your personal way of approaching a project. For instance, if you are doing detailed scrollwork, you may feel that slowing the speed is beneficial to your style of work. 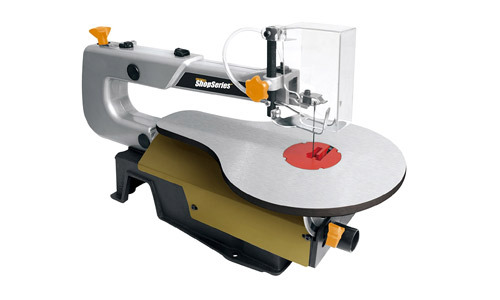 Others might not use their scroll saw for detailed work, so have no need for a variable speed control. So consider carefully, if you work on primarily soft wood, you would probably use 400 to 800 strokes per minute, but if you work with hard woods most of the time, then a 1200 to 1800 stroke per minute speed would work. Either way, it’s probably best to go with a scroll saw that has a variable speed control. If you are new to scroll saws, this might be a confusing concept. Throat capacity simply refers to how much space lies between the blade and the front of the arm swivel. In other words, throat capacity tells you how large of a work area you’ll have on the saw. Tables can come in cast iron or aluminum. Aluminum tables are much lighter, while cast iron tables offer extreme durability and a smooth working surface. As for vibration, the aluminum table will vibrate more, while the cast iron table reduces vibrations. Many scroll saw models will have a table that tilts to the left so you can perform bevel cuts. If you don’t wish to turn your piece over, you can purchase a table which tilts in both directions. Consider what it is you will be making. 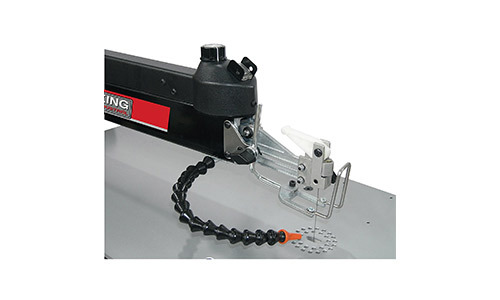 If your projects involve beveling, then the tilting arm is the best bet for you. Arms that tilt do the exact same thing as a tilting table, some woodworkers find a tilting arm easier to use than a tilting table. Lifting arms offer you a convenient way to make interior cuts. Sawdust is simply part of the bargain when you work with wood. When it sprays around your workroom it makes a mess, and is also not too healthy to breathe in. Look for scroll saws that have a dust port. Flexible blowers are used to clear off the area while you are cutting, so the cut line remains visible. Finding the best power scroll saw for you is not such a complex task after all. Most scrollers are hobbyists and are in it for the joy of creating, while some woodworkers just use a scrolling saw to make trim when they need it. Whatever your endeavor, you’ll find plenty of fellow scrollers online in scrolling groups, sharing patterns for everything from decorations to making fancy wood trims and crafts. As long as you know what you plan on making, what features you’ll want, and how much you are willing to spend, we know you’ll end up with the perfect scrolling saw which will give you years of happy scrolling fun!